God Gives Evidence of Who the Rider of the Rev. 6 White Horse Is! God given evidence of who the Rider of the Rev. 6 White Horse is! the Rev. 6 White Horse! What Every Christian Should Understand about the Rev. 6 White Horse! And why the Lord rides with the Red, Black and Pale horses! 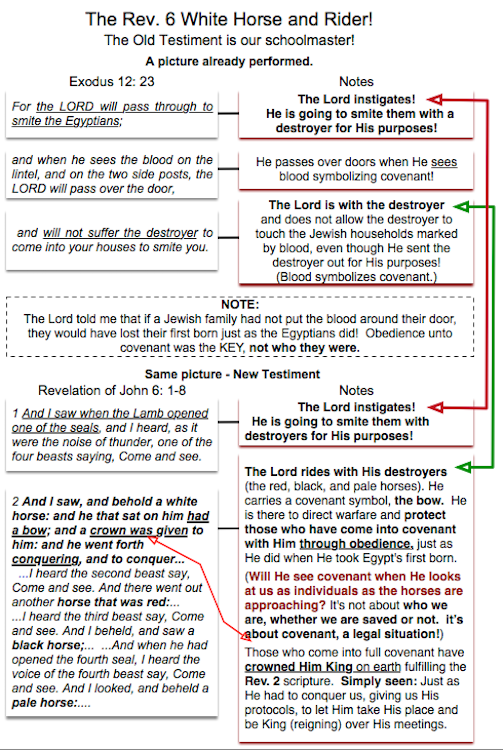 On May 9,2010, I asked the Lord about writing what I knew about the White Horse of Revelation 6. He said, “Hold off.” He also revealed to a person here that there was something not seen yet, but it was coming forth. Before the month of April, 2011, the Lord revealed to me what He wanted me to have. It was some biblical evidence of what I already knew about the White Horse Rider of Revelation 6 being the Lord Jesus Christ. It’s a biblical picture of the “ways of God” found in the Old Testament - our school master, according to scripture. From what the Lord has revealed, we can see how important it is for Christians to come into covenant with the Lord! It won’t matter that you are a Christian and saved unto eternal life, just like it didn’t matter that the Jews were Jews when the death angel came. They had to have blood over their doors in obedience. Christians need to come into covenant with the Lord so He can legally protect His people when the Four Horsemen ride. It is a legal issue in the spirit realm! He is a God of covenants, not of mutual agreement as He told me in the beginning. God reveals the seriousness of what has happened. I am going to share the following because the Lord gave me a scene in the night on July 14, 2011, revealing the seriousness of what has already happened. In the scene I was working in a field the enemy had already flooded and the water was still rising. In other words the enemy of mankind has already flooded the minds of men concerning the Rider of the White Horse of Revelation 6. That flooding of the minds of men is still increasing. But that is not all the Lord revealed. I saw a man, a pretty serious follower of the Lord, fertilizing the flood of the enemy, thinking he was fertilizing the field. That field represented the subject of the Rev. 6 White Horse. The scene is simple, but God has revealed a very serious problem with man's ideas about this subject. We must learn God’s ways. I have known for years that the rider of the White Horse in Rev. 6 was Jesus Christ because God will not confuse symbolisms in His Word. It’s one of God’s ways! In the following excerpt from Uncharted Waters Link we see that to ride the wings of a bird in flight into victory with Me takes two things: Those who learn My ways, and find My calendar. The Lord wants His people to walk in the knowledge and understanding of what He is doing. This involves knowing His calendar. ...Oh that you would hear My voice, from the waters of the fountain of a pen. Oh that you could hear the sound of that fountain. Can you hear? Am I not God? I say, 'Come.' I call you to My ways and My calendar of events. The church in the world has its calendar and I have Mine. Some have made their calendar from My Word, yet they err. Even those whom I have gifted have their own calendar, but I am the Lord and I have Mine. I reveal My calendar step by step. Those who learn My ways, and find My calendar, shall ride the wings of a bird in flight into victory with Me. I have designed the Way. It is Me, it is Truth, it is Love, it is My pattern, it has My purpose. Know, My calendar stands. Time is short. 'Come forth, Bride!'…. In what the Lord revealed there is an important pattern to recognize. Learning His ways comes before finding His calendar, Those who learn My ways, and find My calendar. Simply, if we don’t learn His ways we won’t really find His calendar. The Four Horseman of the Apocalypse are certainly in the Lord’s calendar, so understanding the truth of the picture presented is important! This is why He is pouring information out like He is, so we can understand and come into covenant with Him! When I placed the information on the site of the White Horse of Rev. 6 carrying the USA Flag, I had some people objecting saying the vision Ada Cavellier had was not from God. Some suggested she was mistaken, it could not be the Revelation 6 White Horse that she saw. Truthfully, I heard some very strange doctrines, seemingly things that people just want to believe. This comes from people not having learned God’s ways: Some have made their calendar from My Word, yet they err. Even those whom I have gifted have their own calendar, but I am the Lord and I have Mine. Those who learn My ways, and find My calendar... 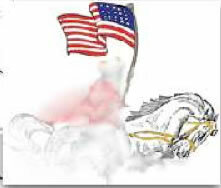 It also stems from preconceived ideas of what the Revelation 6 White Horse and Rider represent symbolically. Horses symbolically have to do with spirit or a spiritual force. White represents purity, light, holiness, triumph, festival, glory, majesty & truth - mainly truth. As I have said elsewhere, clothing represents acts. Gold has always represented refinement, a finished product such as - refined as gold. Pure gold is as glass, as revealed in seeing the Marriage Feast table. Link Silver has always represented a purging of sorts, such as - saints purified by affliction. God has never varied symbolism concerning gold, silver, black and white, and so on, in our corporate Flow Chart. God established a symbolism with a place where I first started to farm when I got married. It was “new beginnings.” So I know when I’m given a vision or dream and it takes place on that farm, God is revealing that what He is bringing forth is something new for or to me. Starting in 1989, we have been keeping corporate flow chart information and we have never had God change a basic symbolism on us. Why? Paul the apostle said that God is not the author of confusion, but He does sometimes confuse His enemies. So we see one of the ways of God is to not change basic symbolism once He has established it. Remember we must learn God’s ways to find His calendar. Those who learn My ways, and find My calendar…. So we see the importance of finding His calendar in and related to the Book of Revelation because that is where He is in His calendar right now. I Saw the Lord of the Book of Revelation and He was waiting on us to join Him. He revealed this because He reveals His calendar step by step, as He says in Uncharted Waters. Are we going to join Him by learning His ways, and knowing His calendar? The four Apocalypse Horses have to do with Judgement. Jesus loves mankind and died for us because of what happened in the garden, but He doesn't like most of what mankind does. Notice in the Revelation19 White Horse scriptures it says: and he treads the wine press of the fierceness and wrath of Almighty God. He is right in there with the wrath of Almighty God, just as the Revelation 6 Four Horses of the Apocalypse symbolism reveals, and as Exodus 12: 23 reveals! There is purpose and legalities involved in all that Jesus is doing concerning End Times. It’s all to turn mankind to Him. Jesus said, “These things must needs be.” With the exception of a few, mankind has been ignoring God for thousands of years. Governments ignore Him, churches have a form of religion and so on. Calamities do cause some people to turn to God, becoming more purified. Yes, the Lord is going to receive a crown on this earth making Him King here. It’s about His Kingdom reigning here as scripture reveals, especially the White Horse scriptures! It’s about eternity and what I would call the “Eternal Gospel.” Jesus told me to think “Eternity,” which is what He does and why He must do what He must do in these Last Days. As I have seen with my own eyes, the New Heaven and the New Earth already exist in God. It is superimposed into what the Lord is thinking about in what He must do. (Everyone should watch the New Heaven and the New Earth movie until they get hold of what Jesus has planned.) You cannot separate the New Heaven and the New Earth from eternity, they are one. I was taken there to see, as revealed on this site. It was done for you! I shudder at the pride I see in mankind after having seen what I have seen concerning the New Heaven and New Earth and being in Heaven twice. Once to see the books of judgement we are to be judged by. Once so I could fully understand how the Mechanics of Salvation work. There are no experiences to be had on this earth that are worth missing the New Heaven and the New Earth. If you gathered all the experiences of every individual who ever lived and brought them together to be had by one person, they would not be worth missing the New Heaven and the New Earth. It doesn’t matter if you are a leader of a country, a religion, the pope, or common man, you don’t want to miss the New Heaven and the New Earth. Man cannot imagine the things God has planned for him there. Jesus wants His church to learn His ways, come into covenant and walk with Him through End Time events. He has made the way. He always does. It is a time to rejoice for the time is at hand, but as the Lord said, “It is a solemn occasion.” We must not take on pride at the destruction of the wicked. The Lord of the Book of Revelation is waiting on us. I saw Him waiting! The next time you read about the Apocalypse Horses of Revelation 6 you will see that the Lord is in the picture, just as He was in the action against the first born of Egypt to judge and protect those who obeyed with the symbol of His blood covenant (according to His will). Just as those plagues brought about His reign in Egypt, the actions of the Horses of Revelation 6 will be instrumental in bringing people to realize that Jesus is King of this earth and His Kingdom will be established here. I was looking at the words, “Thy Kingdom come, Thy will be done….” from the Lord's prayer his people have been praying since His time. They were suspended in mid-air in front of me. I was told to say, “This is here!” the rest of that phrase - on earth as it is in Heaven! It is refinement through tribulation. 2 And I saw, and behold a white horse: and he that sat on him had a bow; and a crown was given to him: and he went forth conquering, and to conquer. 5 And when he had opened the third seal, I heard the third beast say, Come and see. And I beheld, and see a black horse; and he that sat on him had a pair of balances in his hand. 6 And I heard a voice in the middle of the four beasts say, A measure of wheat for a penny, and three measures of barley for a penny; and see you hurt not the oil and the wine. 8 And I looked, and behold a pale horse: and his name that sat on him was Death, and Hell followed with him. And power was given to them over the fourth part of the earth, to kill with sword, and with hunger, and with death, and with the beasts of the earth. Which is to come into covenant with the Lord!